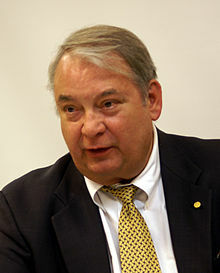 Ferid Murad (born September 14, 1936) is an American physician and pharmacologist. Murad is best known for his discoveries which concern the cyclic GMP as a signaling molecule in the cardiovascular system. He won the Nobel Prize in Physiology or Medicine in 1997 for his discoveries. He shared the prize with Robert F. Furchgott and Louis Ignarro. Murad is an honorary member of the Academy of Sciences and Arts of Kosovo. In May 2012, the Municipality of Čair proclaimed Murad as an honorary citizen. During the ceremony, Murad dedicated all of his achievements to his nation, Albania. ↑ 1.0 1.1 1.2 "Ferid Murad - Facts". Nobelprize.org. Retrieved 2014-06-28. ↑ "Arritjet ia dedikoj kombit tim!". Telefrafi. Retrieved 2014-06-28. This page was last changed on 4 January 2018, at 03:54.